I’ve finished using Yuskin, so I bought this one instead that since they're often compared to each other. This contains camphor like Yuskin, so scent wise, it'll be either a hit or miss for most people. It doesn't bother me at all though. This smells smoother than Yuskin. Yuskin has a hard texture that is hard to apply, but this Medical Cream is soft and glides on well. I also like how the texture stays smooth after I apply it. Moisture wise, I think they're both the same. Yuskin keeps the skin moisturized for a long time, but it feels sticky. 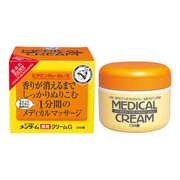 However, this Medical Cream feels smooth. This is also cheaper and just as moisturizing. It doesn’t leave your skin sticky, so I personally prefer this. I bought the 185g product for about 400yen. I’ve used Yuskin all my life. Compared to Yuskin, this has a softer texture, but Yuskin is much more moisturizing. I use Yuskin before going to sleep, and Medical during the day to moisturize. It is moisturizing enough to use as a hand cream, and since it’s a soft cream, I can easily apply it on dry areas on my body. After applying, it feels a little slimy, but it turns so smooth I can start using my phone in less than a minute. It’s cheap, so I can use as much as I want, and I’m also satisfied with its moisturizing power. It doesn’t smell so nice, but the smell goes away quickly. I like the texture and scent and how easy it is to use. There are other creams with a high moisturizing effect, but they cause painful acne. However this product is safe to use on dry or problem skin. If you apply it thoroughly, it won’t become sticky. After you massage it into your skin, you’ll feel it become soft and smooth. I’m happy that I can buy it at practically any drug store or supermarket! I can use it on my whole body, and on places that are particularly dry I just pile it on and go to bed. The next day I definitely feel the effect! With changes in the weather or my health, my skin always becomes really dry in cold weather. During those times, I massage this in before sleep. Actually, I use either this or Yuskin A depending on how I feel. Yuskin is a little more moisturizing, but doesn’t seem to really get rid of that hard, flaky skin. With this, I massage it in and my skin becomes super smooth to the touch. As for which is better — they’re both great. I guess there are people out there who won’t like the smell, but I just think about the fact that the product is doing its job and don’t worry about it. In the morning I don’t even need to use a cleanser, I just wash my face with lukewarm water. Surprisingly, blackheads on my chin and nostrils have disappeared. Maybe it will remove excess oil as well?